Forgive the cheesy hearts, but they really were the product of a broken heart. In the depths of the longest winter I've ever experienced here in Vancouver (this has been going on for close to 3 months now: imagine that! ), I wanted something warm, something comforting. What better than a chicken pot pie, which, in my imaginings, was a creamy chicken stew with buttery, flakey puff pastry on top. I had imagined myself digging through the layers of puff pastry to get to the chicken underneath. It all started happily enough. 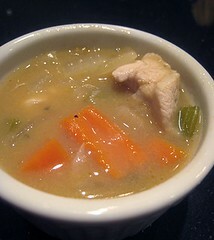 My chicken stew started with a mirepoix (onions, carrots, celery) and finished with a cup of cream. 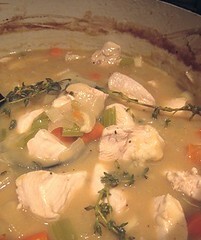 I added the herbs (thyme, bay), the cubed chicken breasts, and the stock (turkey stock) in between. When the chicken stew part was done on the stovetop, I asked TS about the puff pastry. We used our dutch oven but, as is evidenced in the photograph above, the stew only filled it about halfway up. However, I didn't want to transfer it to a smaller pot, resulting in one more pot for me to wash! I thought we could put the puff pastry on top of the pot that I used and just shove the whole thing into the oven until the pastry puffs and is golden. That was the genesis of the heartbreak. I rolled out the puff pastry. Then, we had two options. I could put the puff pastry over the top of the pot and pinch it against the edges. But, it would be a little strange to open up the pastry, reach down... reach down... reach down... and keep reaching down until one hit the chicken portion of the pot pie. Or, I could have the puff pastry on top of the stew itself. Then, when one cracked the pastry open, one would also spoon out some lovely chicken stew. I guess we reached a consensus and agreed on the latter. We placed the puff pastry-covered chicken stew into the oven. After about 10 to 15 minutes, we took the pot out of the oven. The puff pastry had sunk into the chicken stew and was a big soggy mess. Oh no! What to do? What to do? 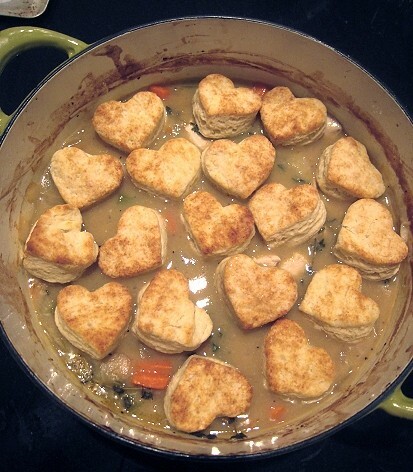 We fished out the soggy mess and quickly came up with the idea of having biscuits on top of the stew instead. Although biscuit dough is usually placed on top of the stew and baked, we decided to play it safe and bake the biscuits on their own. Of course, we would have to come up with a biscuit recipe. In How to Cook Everything, there's a recipe for the usual Buttermilk Biscuits. But, as a variation, he had "Emergency" Biscuits. I started laughing because, yes, this really was an EMERGENCY!! Actually, I used the Baking Powder Biscuits recipe because the Emergency ones still called for buttermilk. I used more baking powder and normal milk instead of the buttermilk (which we didn't have and if we were to make a subsitute by adding acid to milk, would require us to wait for about 15 minutes). So, I made the dough, rolled it out and scrambled to find cookie cutters. We don't have any round cookie cutters. What we did have were small very kooky-shaped cutters, of which the most "normal" shape was the heart. It ended up one pretty respectable chicken pot pie. We made these hearts by chance, but what better day than today to post about them? Mix dry ingredients together in a food processor. Use a large spoon to stir in the yogurt ot buttermilk, just until the miture forms a ball. Turn dough out onto a lightly floured surface and knead ten times; no more. Don't worry if it sticks a but to your hands. 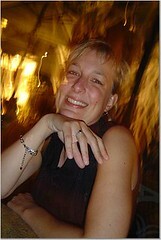 Press into a 3/4-inch-thick rectangle and cut into 2-inch rounds. Pleace the rounds on an ungreased baking sheet. Gently reshape the leftover dough and cut again. Bake 7 to 9 minutes, or until biscuits are golden brown. Use 4 teaspoons baking powder and sweet milk in place of yogurt or buttermilk. Proceed as above. I love it...so sweet looking! 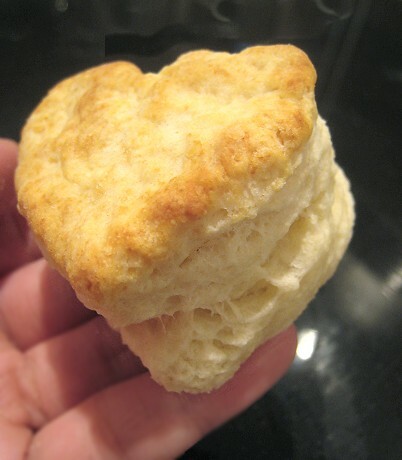 Your biscuits look great - so light and flaky. That's the kind of recovery people would think was intentional if you didn't say anything. Well done! Well you certainly turned that problem around & into such a cute dish! You biscuits look amazingly flaky! Absolutely adorable! Your emergency biscuits puffed up so beautifully. Bravo! 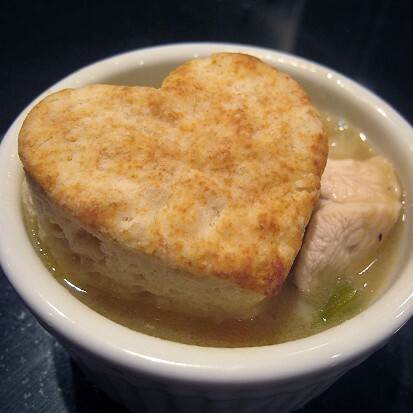 This looks like the perfect dinner for a stay at home Valentine's! What a lovely story. The dish looks perfect for this time of year. Kudos on your quick thinking - I think I would have given up after the first bake! 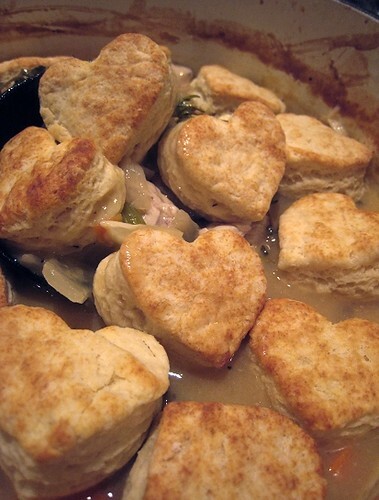 Your emergency heart biscuits are perfect! Sorry to hear it didn't go so smoothly. I'll have to keep those emergency biscuits in mind. They look so nice and flaky. A pot full of hearts! They look so cute. The winter here in Minnesota is neverending - this recipe made it just a bit warmer! Thanks. JS claims that it looks kooky! Oh, puff pastry is just good anywhere. Yehey! Bittman to the rescue indeed. Oh, we do like to give up too. ;) But, I guess we forgot to do so this time. Teehee. I was giggling as I took pictures of them.